They’re all teams, 30 of them in the NBA. But some, like the Bulls, just seem like more of a team than others. And it came through once again Monday in a 94-80 victory over the Boston Celtics. The win moved the Bulls to a season-best 10 games over .500 and tied for third in the Eastern Conference with the Toronto Raptors, though if it ended that way the Raptors would win the tiebreaker by virtue of being a division winner. But this latest run by the Bulls with their seventh win in the last 10 raises all sorts of postseason scenarios with the Indiana Pacers in a free fall and now second in the conference. Suddenly, third is looking like the place to be to potentially avoid Brooklyn in the first round and Miami in the second if things stay like they are. And the Bulls may be headed that way not only in this unexpected season without the injured Derrick Rose and traded Luol Deng, but a united team effort in the ultimate sense. Dunleavy leading in scoring was just another example. Perhaps no team in the NBA reflects and embraces sharing and unselfishness like the Bulls. Sure, there are teams that pass the ball as frequently and give of themselves for their teammates as often. But rarely do you have the game to game changes in the dominant figure as often as it seems with the Bulls. In Sunday’s win in Boston, D.J. Augustin scored a career-high 33 points. So the Celtics, though limited Monday with Rajon Rondo sitting out and Avery Bradley getting hurt, focused more attention and defense on Augustin. He had just four points, but he led the team with 11 assists. Over the last six games, six different Bulls players have led the team in scoring with Augustin and Jimmy Butler tied in one game. The only repeater was Augustin. In that same span, three different players have led in rebounding and four different Bulls have been the team leader in assists. And that Dunleavy led the team in scoring was perhaps appropriate because he is another, like Joakim Noah, like Taj Gibson, like Jimmy Butler, who symbolize this Bulls team in the myriad things they do to impact winning. There is no big star on this Bulls team without Rose, though Noah has been getting plenty of accolades this season and is averaging 14 points, 10 rebounds and 7.5 assists in March as one of the league’s top players of the month. The recommended formula for success is to have a great star. That’s difficult to dispute with LeBron James going for a third straight NBA championship. The Bulls understand that as well as anyone having had Michael Jordan, the greatest of the great. But not everyone gets a star; there are far too few to go around. Most franchises never will get one. So do you give up? No, you compete. And this is what this Bulls team has done in ignoring those who insisted they couldn’t or it wasn’t worthwhile. Dunleavy is another wonderful example. The lean 6-10 forward turned down more substantial financial offers to come to the Bulls for perhaps a long playoff run. But suddenly, Rose is out, the team is losing regularly, Deng is traded and while prepping for a reserve role Dunleavy is in the starting lineup averaging his most minutes per game in six years. By his own admission, it’s been a difficult shooting season. Though a respectable 37 percent on threes, it’s Dunleavy’s lowest in four years. It’s bothered Dunleavy, who is serious and quiet with an impish sense of humor, admired by his teammates for his sangfroid and toughness. He’s angered opponents with his hard screens—which Bulls coach Tom Thibodeau calls the best on the team—and he by far takes the most charges on the team. He added another in the second quarter when Jeff Green tried to go up for a dunk and Dunleavy stood his ground for the charge. He’s a nice looking young man, though his face is oddly decorated with stitch marks, the most recent a 10-stitch gash earlier this month on a charge in a win over Houston. Thibodeau and Dunleavy are made for one another as Thibodeau related their conversation as Dunleavy, whom the Bulls had said was unlikely to return in that game, was getting sewn up. Dunleavy went back out and drew another charge within minutes. You don’t have to ask Mike Dunleavy twice. There’s so much, though subtle, to Dunleavy, which can be missed. He’s a terrific outlet passer and found Noah on a runout for a score and three-point play midway through the third quarter that kept the Bulls ahead 59-55 until they broke open the game with a 13-0 and 17-2 start to the fourth quarter. 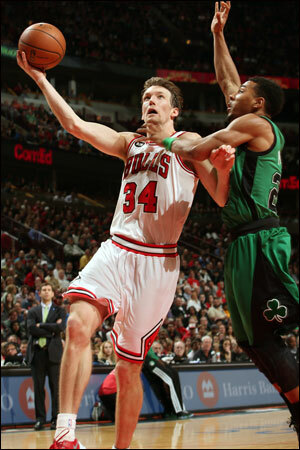 Of course, it was shooting that Dunleavy was known for as he made 43 percent on threes for the Bucks last season. But the Bulls are not a team shooters love. The Bulls have been one of the poorest shooting teams in the league, tied with the 76ers for last in field goal percentage going into Monday’s game. But it’s not that the Bulls have such poor shooters. The Bulls offense has been confounding to many teams with Noah’s passing and playmaking. But it’s not an offense particularly conducive to shooting in this NBA, which relies on the three pointer. Most NBA offenses, as the Bulls did with Rose, rely on screen/roll and drive and kick with stretch power forwards to shoot. The Bulls have an active offense in moving the ball and moving players, one of the fundamentals of sound offensive play. But their spacing isn’t great because their big men don’t go outside to space the floor. So driving lanes don’t open as much for kickouts. Thus the shooters like Dunleavy are caught manufacturing more difficult shots with less spacing. It doesn’t do much for your percentage. So you find other ways. That’s something of the Bulls mantra this season emphasized by Thibodeau virtually every game, and it’s been embraced by the players. It was another game closer Monday in the unusual back to back with the Celtics, who are lottery bound and Monday shorthanded with Rondo sitting out second of back to backs after knee surgery and then backcourt mate Bradley going out. The Celtics sent in their D-League crash squad, and Phil Pressey did a nice job harassing Augustin. The Celtics sunk in to cut off the driving lanes for Augustin and overloaded on his pick and roll. The shots were tougher and he was one of nine. But Carlos Boozer again shot well and had 16 points in 24 minutes, Taj Gibson bounced back from an off night with 14 points and 11 rebounds and the highlight dunk of the game on a nice hookup from Noah to Jimmy Butler to Gibson over Kris Humphries in the fourth quarter. Butler added 18 points and Noah continued his all around play with 19 points, 11 rebounds, five assists, two steals and two blocks. The Celtics are overmatched and these sorts of games seem an inevitability, though you still have to compete. The Bulls led just 25-24 after a strong 11-5 start. 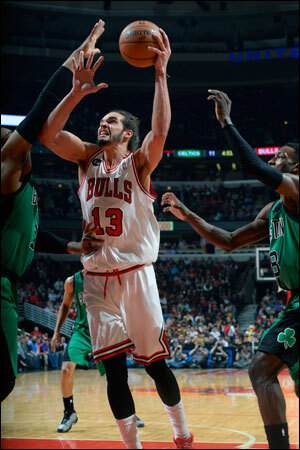 The Celtics took a 50-48 halftime lead in a messy second quarter when the Bulls committed eight turnovers. Though Gibson had a nice follow up slam on an Augustin driving miss and Dunleavy was hitting in transition, which is important for the Bulls offense. The Celtics hung around all third quarter and trailed just 71-70 entering the fourth quarter as Jerryd Bayless and Brandon Bass each finished with 18. But the Celtics play a lot of isolation without Rondo and it would fail them when the Bulls tightened up in the fourth quarter. It began with Noah going up strong, Dunleavy with a corner three in transition, then fouled on a runout and making both (26-6 Bulls in fast breaks after 12-10 Boston on Sunday), Noah with an elbow jumper, that highlight Gibson slam dunk, Noah a drive, Gibson a jumper, Butler a jumper and it was all but over midway through the fourth. And who knows where it can lead with this sort of team camaraderie and production.